When working with precision metal products, different fabrication processes, including Shearing, CNC Operations, Press Brake Forming, and drilling to name a few, are used based on the part or component involved. Although, most sheet metal products made for various industries such as HVAC, light fixture manufacturers, automobile industry, appliance manufacturers, electronic manufacturers to name a few they are also used by people for individual purposes. There are typically more pros than cons in getting parts made with sheet metal. For starters, the list of parts and components that can be fabricated is almost endless. In addition products are customized to individual industry’s requirement. With the right technique, this adds value to metal elements. Precision metal fabrication is also automated. This ensures that the end products are consistent and have an unparalleled level of quality. Automation also minimizes labor needs, which reduces the cost per piece. Another factor is that automated processes can run 24 hours a day. In addition to shorter lead times, this makes it easier to fill rush orders. Even if the order’s volume increases at the last minute, running the equipment for an additional shift is a viable option. Especially when having parts and components mass produced, a tremendous amount of lead time is saved. Therefore, companies can have metal components fabricated quickly and precisely, which allows for a fast turnaround to their customers. Ultimately, this is good for both parties. For the company having metal elements made, this helps build both brand and reputation. For their customer, this makes it possible to get consumer goods to market faster, which equates to more profit. Flexibility is another advantage of precision metal fabrication. If the customer has a quick change, modification can be implemented easily. For standard and customized orders, as well as short and long-runs, the metal elements meet exact customer specifications. On the downside, more detail forms of a stamping cutting or pressing cutting tool may be required when dealing with oddly-shaped or complex parts and components. 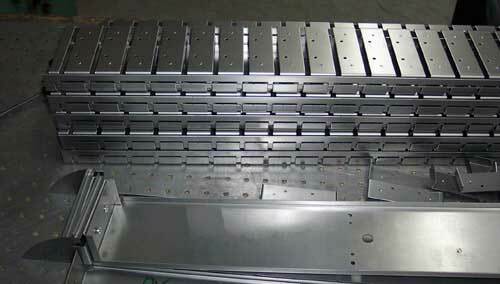 In those instances, the fabrication of precision parts and components can be more labor intensive. Because of that, the customer could end up paying a higher cost per piece. At Weldflow Metal Products, we take immense pride in the precision metal products that we fabricate. We offer years of experienced and unrivaled expertise in the making of different parts and components used by a broad range of industries. To learn more about our services, visit our website, or to speak to a company representative, please call us directly. This entry was posted in Uncategorized and tagged precision metal products, precision sheet metal fabrication. Bookmark the permalink.